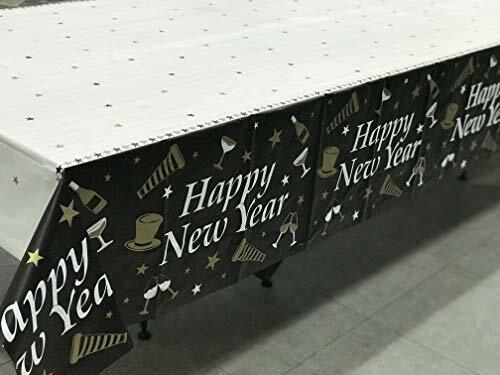 Pack of 3 Happy New Year Table cover 54"x108"
HAPPY NEW YEAR!!! These straw decorations are professionally printed on heavy-duty cardstock paper with a photo-like shine. They will require some easy assembly for 2019 New Year's Eve. Get creative with your DIY New Year's Eve party decoration ideas! Beistle 88780NRBKG Gold Legacy Assortment for 10 People. This black and gold assortment has enough items for 10 people to use. The assortment includes 5 pieces black plastic top hats with gold print and gold foil bands, 5 pieces black and gold glittered fringed tiaras, 5 pieces gold foil horns with white mouthpieces, 5 pieces black poly leis, 5 pieces black noisemakers and 20 pieces black serpentine throws. Decorate your wedding or party with 16" tall aluminum foil balloons !These balloons are the perfect addition to any wedding, party or special event! Lightweight and easy to assemble, balloons will transform any event with their cheerful bright colors and full look! Choose from a variety of colors and sizes for your event!Additional Information:* Each balloon measures 16" inflated. * Balloons can only be filled with air* Material: Aluminum foil. * Note: Balloons are shipped flat. * CHOKING HAZARD - Children under 8 years can choke or suffocate on uninflated or broken balloons. Our Chicago Swing New Year's Party Kits feature a fun swing and flapper theme. 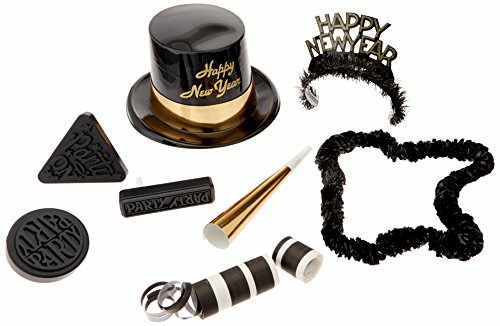 This set provides you with fun party items and favors for your New Year's party. You'll receive mini fabric fedoras, feather accented tiaras, horn noisemakers, and 33 party beads. This kit can serve a party of 25. 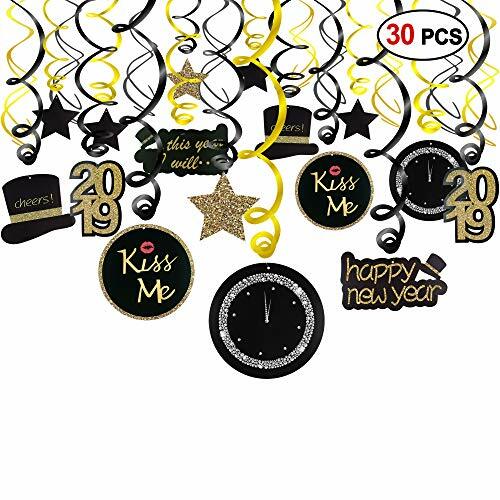 4 Count: New Years Eve Wine Bottle Sticker Labels with Matching Neck Gift Tags to add to your black and gold party supplies for New Years Eve 2019.2 sticker sheets included - 4 wine labels with gift tag stickers for the neck of your wine bottles. REAL, SHINY METALLIC GOLD FOIL. Wine bottle labels are 4 x 5 inches each. WINE BOTTLES NOT INCLUDED. Water Resistant - high quality foil label paper. Labels are self-adhesive - easy to peel and stick. Fit on most standard size and shape wine bottles - best on 750ml bottles. Also fit on many liquor bottles as well. Use decorated wine bottles as New Years Eve party favors for adults, or a New Years Eve gift for your party host. Also use decorated wine bottles as New Years Eve table decorations and centerpieces, a great addition to New Years Eve tableware. Featuring New Years Eve fireworks party supplies designs on gold foil. To use as New Years Eve party favors, simply write on the included neck gift tag stickers. Neck gift tags are to and from format - easy to write on with ballpoint pen or permanent marker. Neck gift tags are designed to match your black and gold New Years Eve wine labels - optional to use. 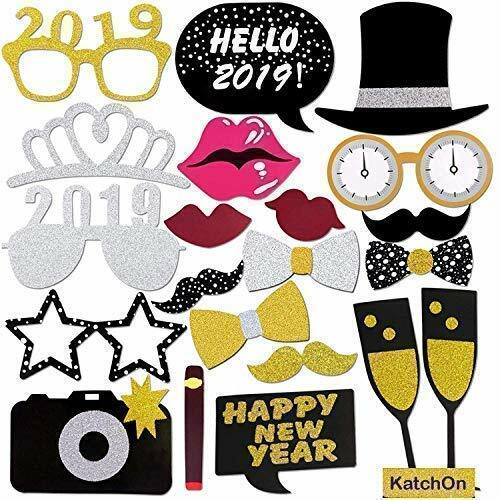 Use the DISTINCTIVS 2019 New Years Eve wine bottle sticker labels as part of your black and gold party supplies. These fireworks theme stickers are a great alternative to bulky NYE wine bottle covers. These labels work as New Years Eve gift wrap for giving wine bottles as gifts. Pair these labels with your tableware for a picture-perfect 2019 New Years Eve party. Use the unique neck gift tag stickers to make party favors for your guests. These water resistant, self-adhesive wine bottle stickers are sure to make your NYE event memorable. These sticker labels pair especially well with black and gold New Years Eve party decorations. New Years Eve party wine labels make lovely decorations or gifts to help you say Happy New Year. Bottles are NOT included. 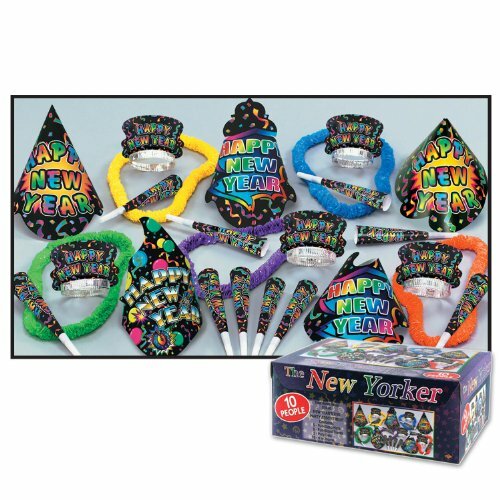 Add a little fun to help your family ring in the New Year with this Super Bonanza New Year's Party Favors Assortment. This kit contains enough party accessories for up to 100 people. 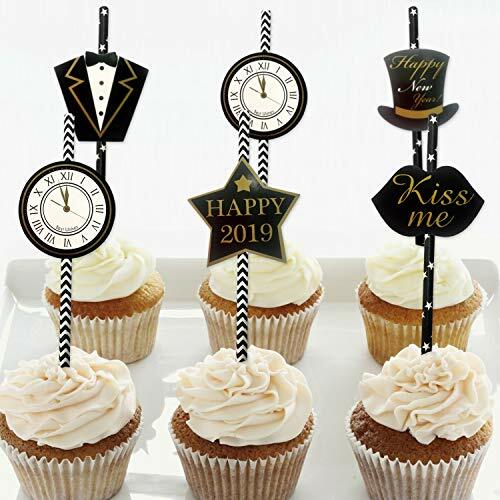 Within this New Year's party kit, there are holiday party favors ranging from a bartender hi-hat and plumed waitress tiara to 50 noisemakers and 50 assorted balloons. 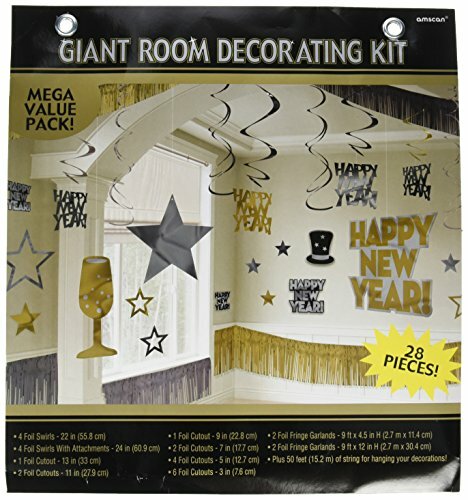 Celebrate the New Year in style with our Gold New Years Eve Party kit. Create your fun place with our fun kit. Your friends will love it.